This paper presents a theoretical growth model that extends the Mankiw–Romer–Weil (MRW) model by accounting for technological interdependence among regional economies. Interdependence is assumed to work through spatial externalities caused by disembodied knowledge diffusion. The transition from theory to econometrics leads to a reduced-form empirical spatial Durbin model specification that explains the variation in regional levels of per worker output at steady state. A system of 198 regions across 22 European countries over the period from 1995 to 2004 is used to empirically test the model. 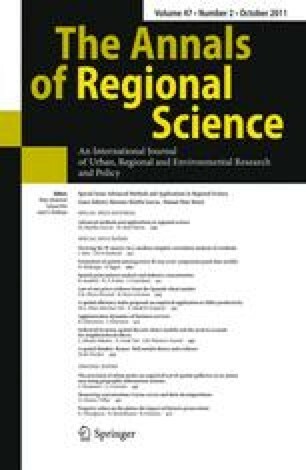 Testing is performed by assessing the importance of cross-region technological interdependence and measuring direct and indirect (spillover) effects of the MRW determinants on regional output.